1897 May 7 Barrwood No 1 Pit Stirling Wm Baird & Co Ltd Alexr. Drain Brusher 30 Falls of roof Fall of roof at brushing face. Injured on 7th May, 1897, and died on 15th March, 1898. 1897 October 1 Herbertshire No 3 Stirling R Addie & Sons Collieries Ltd Henry Logie Drawer 27 Falls of roof Fall of roof on drawing road. Injured on 1st October, 1897, and died on 6th March, 1898. 1897 November 16 Grangemouth Stirling Grangemouth Coal Co Ltd Alex. Marshall Miner 23 Falls of roof Deceased was taking off coal, when the roof fell upon him. 1898 January 12 Bardykes Lanark Merry & Cunninghame Ltd Mary Rafferty Stone picker 17 On surface  By machinery While crawling up a shoot from the shaker scree to release a piece of coal her shawl and hair were caught by a revolving shaft. From Main body of report: The deceased had crawled up a coal shoot where she had no occasion to go, when her clothes got caught by a revolving shaft. 1898 January 12 Kinneil Linlithgow Kinneil Coal & Coke Co Ltd Joseph Gallacher Waggon trimmer 30 On Surface  On railways and tramways While pushing an empty waggon forward to the screen another moved forward, and deceased was crushed between them. The latter waggon was not trigged. 1898 January 19 Muiredge Fife Bowman & Co Walter Thomson Drawer 17 Falls of roof Deceased and another were filling a tub at a roadhead. when the roof burst out. Deceased tried to escape past the tub, but was caught and completely buried. The other lad escaped along the face. 1898 January 19 Westburn No 1 Lanark Westburn Colliery Co John McVey Miner 28 Falls of roof Fall of roof at working face where a coal cutting machine worked. 1898 January 20 Carfin No 7 Pit Lanark Wm Dixon Ltd Robert Thomson Miner 38 Falls of side While drawing props below the head coal, the coal fell upon him. 1898 January 22 Oakbank (Oil shale) Edinburgh Oakbank Oil Co Ltd Peter Turnbull Drawer 19 Haulage  By ropes and chains breaking While guiding a rake of hutches into a side road off a dook the gabbie broke, and the hutches ran forward and crushed deceased. 1898 January 24 Niddrie Edinburgh Niddrie & Benhar Coal Co Ltd David Conachie Miner 40 Falls of roof Deceased was holing coal, when the roof suddenly burst out, killing him almost instantaneously. 1898 January 25 Broxburn (Oil shale) Linlithgow Broxburn Oil Co Ltd David Ferguson Chain runner 44 Haulage  On inclined and engine planes While ascending an In-going-eye mine on a loaded rake of tubs, deceased's body came in contact with some "crowns" on the roof. 1898 January 25 Whitehill Edinburgh Lothian Coal Co Ltd John Leadbetter Miner 36 Falls of roof Deceased worked in a stooping place, and while engaged holing, he heard the roof "working" to fall, and before he got clear, he was buried beneath the fallen roof. 1898 January 28 Drumpeller Nos 3 and 4 Pits Lanark Summerlee & Mossend Iron & Steel Co Ltd Thomas Ward Brusher 30 Explosions of fire damp or coal dust Explosion of coal dust. A shot of gunpowder, instead of a permitted explosive, was fired in a place which was very dry and dusty, and which had not been watered properly. A special report upon this explosion has already been published. 1898 January 31 Rosebank Fife John Nimmo & Son Ltd Adam Donaldson Oversman 49 In shafts  Miscellaneous Deceased was assisting to redd out an old shaft which had been abandoned 25 years previously. While lifting a stone into the kettle, the point of his finger was lacerated. Blood poisoning resulted, causing his death three weeks afterwards. From Main body of report: An oversman assisting in clearing debris out of an old shaft lacerated his hand, and blood poisoning ensued and caused his death. The old shaft was near some houses and appears to have been a receptacle for dead dogs and cats and other rubbish. 1898 February 4 Loudon Ayr Wm Baird & Co Ltd Archd. Gibson Brusher 25 Falls of roof Fall of roof at coal face while knocking out a prop preparatory to brushing. 1898 February 5 Ingliston (Oil shale) Edinburgh Young's Paraffin Light & Mineral Oil Co Ltd William Gardner Miner 33 Miscellaneous underground  By explosives While taking gunpowder out of a can with which to charge a shot, a spark fell from deceased's lamp, which was on his cap into the can, igniting the contents and causing an explosion. 1898 February 5 Neilston Stirling James Wood Ltd Robt. Gourlay Engineman 47 On Surface  Miscellaneous He fell off a scaffold, apparently while tightening up a steam joint. 1898 February 14 Dunmore Stirling Moyes, Murray & Co James White Miner 39 Falls of roof Fall of roof at working face. 1898 February 14 Gilmilnscroft No 3 Pit Ayr Gauchalland Coal Co George Connell Miner 45 Falls of roof While "redding" through an old road to reach a stoop the roof fell upon him. 1898 February 24 Montgomeriefield Ayrshire A. Kenneth & Sons Jas. Robertson Drawer 17 In shafts  ropes and chains breaking While descending the shaft in the cage, the rope slipped over the flange of the drum. The cage dropped, and when the rope "stented," the connection with the cage broke and the cage fell to the bottom of the shaft. From Main body of report: The first fatal shaft accident happened at Montgomeriefield Colliery, Ayrshire, and resulted in the death of four boys who were descending the shaft to commence their day's work. The shaft is 80 fathoms deep, and the winding engines are coupled, horizontal, and with two drums 10 feet in diameter. The steel ropes were l 1/8 inches in diameter, and the flanges of the drums projected 4 inches beyond the wood cleading. The rope for the "rise" cage was taken off from below the drum, and when the "rise" cage was at the pithead the rope was coiled round the drum to within an inch of the flange. The cages were doubled decked. 1898 February 25 Ross Lanark Thomas Barr William Henderson Miner 13 Falls of roof Killed by a fall of roof stone, liberated by a "lype" and smooth parting, in a place driven along a stoop side in the Main Coal Seam. 1898 March 3 Wester Gartshore Dumbarton J & A F Wallace David Harper Miner 60 Falls of roof Fall of roof at working face. 1898 March 5 Cornsilloch Lanark Archibald Russell Colin Kerr Miner 27 Falls of roof Deceased was breaking away a place on the rise side of a horse-road. While wedging down a corner, left by the first breaking of coal, a large triangular stone suddenly fell upon him, killing him instantly. 1898 March 9 Earnock Lanark John Watson Ltd Lyle McKerrel Horse driver 23 On Surface  On railways and tramways After uncoupling two moving waggons, deceased appears to have been caught while stepping in between them, and the wheel of the last waggon passed over his leg. 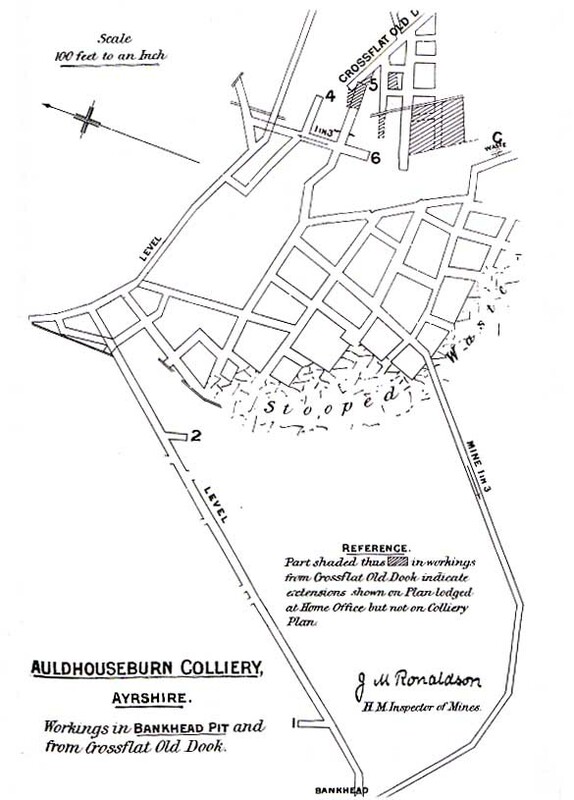 1898 March 11 Auldhouseburn, Bankhead Pit Ayr Cairntable Gas Coal Co Ltd James Shaw Drawer 20 Miscellaneous underground  irruptions of water A miner holed through on old workings containing water, owing to the failure to keep boreholes in advance in terms of General Rule 13. From Main body of report: An irruption of water from old workings took place in Bankhead Pit, Auldhouseburn Colliery and by it three men lost their lives. The Three Feet Seam was being worked, but it is termed the "Seven Feet Seam" in other mines in the locality, as it really consists of the Three and Four Feet Seams in one, with only a few inches of clay separating them. Referring to the accompanying Plan No. 2, Bankhead Pit is the winding and pumping shaft, and the water all gravitates to it. In order to get from the workings to the escape shaft (not shewn on the plan) it was necessary for the workmen to come out to the winding shaft. At the pit bottom there was practically no lodgment for storing water. The adjoining colliery of Crossflat was abandoned in 1882, and the Cairntable Gas Coal Company, Ltd., the owners of Auldhouseburn Colliery, recently acquired this mineral property. On 2nd June, 1897, they wrote to the Secretary of State asking if they could be provided with a copy of the plan of Crossflat workings lodged in the Home Office, and received a reply in the affirmative, but they meanwhile obtained a copy of the workings from the engineer who usually surveyed Crossflat Colliery. On this plan, however, were printed the following significant words : "Not guaranteed as having been surveyed when the pit was stopped." In spite of this they did not take any steps to secure a copy of the Home Office plan, on which were shewn workings not shewn on the plan in their possession. Plan No. 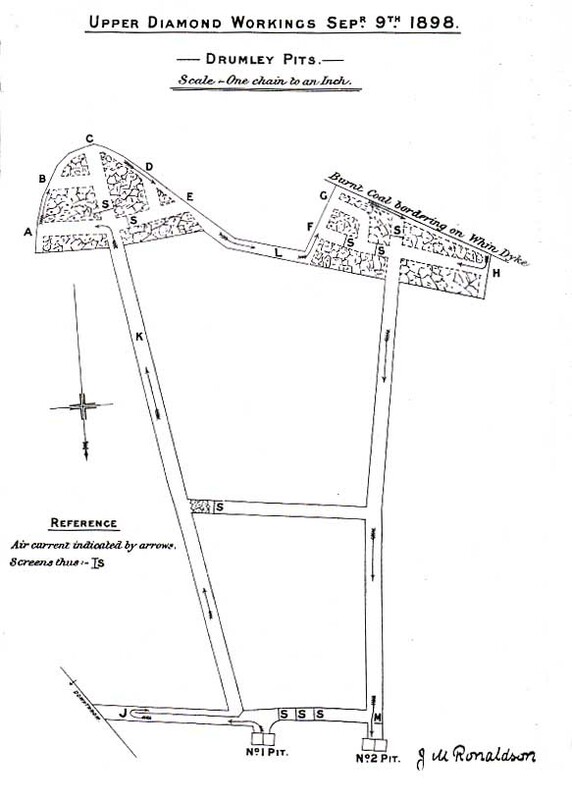 2 shows the relative position of the workings of the two collieries at the time of the accident, according to the plans in the owner's possession, with the addition of the shaded portion of Crossflat workings, which is taken from the Home Office plan. The enlarged Plan No. 3 shows the actual relative position of the workings at the point where the water broke in. Some time previous to the accident a bore was put through on Crossflat workings at the point C, and the waste water was drained off to that level. The working places 3, 4, 5 and 6 were all within forty yards of the old workings, but only in the place 5 were any bore-holes kept in advance, or to the sides, in terms of General Rule 13, while this place was driven 12 feet wide instead of being restricted to not more than 8 feet wide. The place 6 was no less than 18 feet wide, and was driven to within 25 feet of the waste water without any bore-holes whatever. The level A on Plan No. 3 (place 5 on Plan No. 2) had flank bore-holes, as shewn by letters B, but no holes in advance had been bored for some time previous to the outburst. On the morning of the accident, the miner working in the place A had holed in the clay in the middle of the seam to within 21 inches of the waste water without having suspected any danger, when he observed water beginning to come through, and shortly after the water burst through the clay, making a hole which ultimately measured 3 feet 7 inches by 15 inches. The alarm was raised, and the workmen rushed towards the pit bottom. Out of 45 persons in the pit all managed to get up the shaft except 19, whose retreat was cut off by the water rising rapidly in the shaft to a height of 12 feet. The imprisoned men, with the exception of those who were drowned, retired to the rise workings, and it was the next day ere the water was lowered sufficiently far to permit them to ascend the shaft. The bodies of the deceased were found close to the pit bottom, and they seem to have been drowned in their effort to get up the shaft. 1898 March 18 Cowdenbeath Fife Fife Coal Co Ltd George Durham Labourer 65 On Surface  On railways and tramways Deceased was shifting a truck at a coal washing machine, and in running after it to reach the brake, crossed on to the adjoining engine road, immediately in front of a locomotive, which knocked him down and passed over his legs. He had previously been warned of the approach of the locomotive, but appeared to have forgotten it. 1898 March 25 Glenvault Mine (Fire clay mine) Dumbarton George Turnbull & Co Adam Taylor overman 44 Miscellaneous underground  By explosives A spark off his naked light ignited 14 lbs. of gunpowder illegally stored in the mine. 1898 March 31 Kinneil Linlithgow Kinneil Coal & Coke Co Ltd Charles Sneddon Miner 43 Explosions of fire damp or coal dust This accident occurred in a dry and dusty section, giving off gas. Protector Marsaut lamps were used, and blasting with permitted explosives was practised. Only four persons were employed in the section, and the fireman was the only person authorized to fire shots. Sneddon, it was alleged by the Hamiltons, fired a shot at the face, in contravention of General Rule 12 (f). A violent explosion resulted, causing the immediate death of Sneddon and injuries to the Hamiltons, to which Hamilton, Jun., succumbed on the same evening, and Hamilton, Sen., eleven days afterwards. From Main body of report: The only fatal fire-damp explosion occurred at Kinneil Colliery, Linlithgowshire, on the 31st March, and caused the loss of three lives and injury to one person. The explosion was primarily caused by a gross violation of the General and Special Rules on the part of two of the persons who lost their lives. The explosion took place in a section of the Six Feet coal, where only the persons killed and injured by the explosion were employed. The mode of working is longwall. The seam yields fire-damp in considerable quantity, and the workings are dry and dusty. The main roadway leading from the section was dry, but not sufficiently dusty to carry forward the explosion. The miners used locked safety lamps of the Marsaut type. Shots were supposed to be fired only by the firemen, who had been appointed shot-firers. Some fire-damp having been found on several occasions lying near the face of the brushing in a road not in use, shot-firing had been stopped in the section by the Manager's order. Notwithstanding this prohibition, two of the miners prepared and fired a shot in the coal. The evidence pointed to the gas having been ignited by the flame of a lucifer match used in lighting the fuse of the shot, rather than to flame accompanying the explosion of the shot. The explosive used in the pit was Nobel's gelignite, a permitted explosive, and some of this was found in the section after the explosion. Lucifer matches were found in the pockets of the deceased men. The explosion was principally due to fire-damp, but was assisted to some extent by coal dust, which was observed in a coked state on timber in the section after explosion. Judging from what was observed after the; explosion, and from the fact that fire-damp was reported on several occasions before the explosion, the ventilation appears to have been inadequate. The discipline was very slack ; I consider the firing of a shot by a miner in a section where shot-firing was prohibited, and where if any shot was to be fired it should only have been fired by the properly appointed competent person, one of the most dangerous breaches of discipline possible. That the discipline in the mine was bad has been proved by miners continuing to take lucifer matches and pipes into the pit after the explosion ; no fewer than 24 miners from Kinneil Colliery have been fined since the explosion for these offences. At the time of the explosion, the shots were fired by the authorized shot-firers in the Six Feet seam by fuze and safety lighters. This method was, in the Manager's view, in accordance with section 2 (6) of the Explosives in Coal Mines Order, as he was of opinion that it was equally secure against the ignition of inflammable gas or coal dust" as electrical firing. Two kinds of safety lighters were in use. (1) Bickford's patent safety lighter, which consists of a tube of sheet tin closed at one end and containing a source of heat, which is set free on compressing the closed end with a pair of pinchers. The open end of the tube is placed on the fuze and securely fixed by a nip from the pinchers. ('2) Norres' patent safety fuze lighters, a German invention, which consists of a tube of brown paper, in which a cap containing inflammable material is fixed, and through the closed end of which a wire passes to the outside of the tube. The tube was placed on the end of the fuze and held there by one hand while the wire was pulled by the other, and by friction ignited the inflammable material in the cap, which in turn ignited the fuze. Along with both safety igniters white tape asbestos lined fuze was used. 1898 April 1 Portland No 7 Pit Ayr Wm Baird & Co Ltd Wm. McDonald Miner 22 Falls of roof Fall of roof at working face. 1898 April 2 Kenmuirhill No 4 Lanark Dunn Brothers John Mallon Bottomer 20 In shafts  falling from part way down Thinking the cage was at the mid-working he opened the gate, pushed a hutch into the open shaft and fell after it. The indicator in the engine-house was not in order. From Main body of report: The second shaft accident which resulted fatally took place at Kenmuirhill Colliery, through the bottomer at a mid-working opening the gate guarding the shaft when the cage was not there, and pushing an empty hutch into the open shaft and falling after it. It transpired that the indicator, required by the Special Rules to be placed in the engine house and connected with the gate at the mid-working, had not been in operation for weeks previous to the accident. Apparently the bottomer unwittingly contravened the Special Rules by opening the gate when the cage was not at the mid-working, but by the neglect of the officials the engineman was not able to comply with the regulations, which required him to signal to the bottomer should the gate be opened when the cage is not at the mid-working. 1898 April 11 Fergushill No 22 Ayr Archd. Finnie & Son James Richmond Miner 49 Falls of side Fall of "falling" at the working face, owing to the want of sprags. 1898 April 13 Mossband Lanark Linridge Coal Co Archibald McLean Brusher 30 Falls of roof Deceased was widening and brushing a horse-road through a longwall waste. In pulling down some stowage, he relieved a stone which fell upon his back, causing injuries to which he succumbed eleven days afterwards. 1898 April 14 Hill of Beath Fife Fife Coal Co Ltd John Fren Waggon greaser 70 On Surface  On railways and tramways Run over by train of waggons. 1898 April 22 Allanton Lanark Morningside Coal Co Ltd Archibald Scott Drawer 17 Haulage  On inclined and engine planes A set of ten loaded loaded tubs was being lifted from a level at its junction with the engine dook. The two loading tubs were very lightly loaded, and deceased was assisting the dook runner to guide them round the curve. When the strain came on the rope the tubs were pulled off the rails towards the inside of curve and struck deceased, causing injuries to which he succumbed four days afterwards. 1898 April 23 Ayr Colliery, Sundrum No 3 Pit Ayr George Taylor & Co Joseph Nimms Miner 17 Falls of side Fall of coal. 1898 April 28 Carfin No 6 Pit Lanark Wm Dixon Ltd Chas Lafferty Boiler fireman 36 On Surface  Miscellaneous Fall of stone wall in front of boilers owing to the pressure of the dross heaped up behind it. 1898 May 2 Niddrie Edinburgh Niddrie & Benhar Coal Co Ltd James Blyth Drawer 19 Haulage  On inclined and engine planes Deceased was ascending an incline, the average dip of which was 60o. He sat on a carriage with his back towards the roof, and on approaching the lowest part appeared to have leant backwards or raised his head, which came in contact with the roof, and he was knocked backwards over the carriage and fell to the bottom of the incline, a distance of about 135 fathoms. 1898 May 3 Craighead Lanark Wm Baird & Co Ltd Mark McGeachie Drawer 23 Falls of roof Fall at road head of coal which formed the brushing. 1898 May 9 Castlehill Lanark Shotts Iron Co Ltd James Edgar Wagon shifter 26 In shafts  falling into shaft from surface Coal was being filled from a bing, and deceased was placing the loaded tube upon the winding cage at pit mouth, in order that they might be raised to the upper scaffold for screening purposes. Immediately after sending away the cage with a loaded tub, he pushed another tub forward and fell with it to pit bottom, a distance of 30 fathoms. The shaft was fenced with a hinged gate, which deceased neglected to close after placing the tub on the cage. 1898 May 10 Birkenshaw Lanark Larkhall Brickfields Ltd Robert Vallance Miner 24 Falls of roof Killed by a fall of roof stone in a district of long wall workings, in the Virtuewell Seam, recently re-started. 1898 May 14 Prestongrange Haddington Summerlee & Mossend Iron & Steel Co Ltd Robert Harline Brusher 17 Falls of roof Deceased had just turned out a loaded tub on a haulage road, at a point where some men were redding a water course. A bar suddenly broke, and the roof came in over a length of 25 ft., swinging out a number of other bars, and completely burying deceased. 1898 May 18 Birkrigg Lanark Darngavil Coal Co Ltd Robert Rae Manager 30 In shafts  ropes and chains breaking The winding rope broke while deceased was ascending the shaft, and he was precipitated to the bottom, a distance of 40 fathoms. The rope was made of steel wire, was 34 ins. circumference, and had been in use since September 1894. The shaft is 67 fathoms deep, and the rope broke 6 fathoms from the cage. Water constantly ran down the rope, which caused internal corrosion. A series of tests were made with the broken ends of the rope, and the average breaking strain was found to be 18 tons, but the torsional strain was very little. From Main body of report: By the breakage of a rope a manager lost his life. In this case, as in a similar case last year, the rope when tested did not show a great diminution of tensile strength, but the torsional strength was far below what it should be, and it seems probable that the breakage was due to a sudden torsional strain. 1898 May 18 Quarter Lanark Colin Dunlop & Co Harry Smith Labourer 72 On Surface  On railways and tramways Deceased was employed cleaning bricks on the side of the railway leading to the colliery, and it is supposed he was struck by the locomotive engine as it passed. 1898 May 20 Blackston Renfrew Wm Black & Sons Ltd Alexr. Freeman Boiler fireman 42 On surface  By machinery While starting an unfenced donkey engine with his foot it got caught by the flywheel. 1898 May 28 Kelty Fife Fife Coal Co Ltd Euphemia Brown Pithead worker 13 On surface  By machinery While a boy was lowering a hoist cage, which had risen too far, a tub containing an iron pipe was pushed on to it, and the cage fell away suddenly before the hutch was secured, the hutch fell off and struck the deceased girls, who were sitting on a box near foot of hoist. 1898 May 31 Carronrigg Stirling A. G. Moore & Co. Janet Prow Hutch runner 16 On surface  By machinery Caught by the spur wheels of the haulage engine after crawling through the fencing with other girls to take a meal. 1898 June 5 Banknock Colliery, Broomrigg No 3 Pit Stirling Banknock Coal Co Ltd Wm. John Howell Boiler fireman 29 In shafts  falling into shaft from surface In some unexplained manner he fell down the shaft. 1898 June 6 Pathhead Ayr James Gray Samuel McCall Miner 44 Falls of roof Fall of roof at working face. 1898 June 10 Barncluith Lanark Archibald Russell William Fleming Miner 16 Falls of roof Deceased was engaged holing, when the coal suddenly burst off for a distance of 15 ft., the tail end striking him, and killing him instantaneously. The fall extended into adjoining place. 1898 June 10 Dechmont Lanark Dechmont Colliery Co Ltd John McMenemay Drawer 17 Falls of roof Fall of roof on drawing road while passing along it with an empty hutch. 1898 June 10 Harthill Lanark James Wood Ltd David Robb Stone picker 14 On Surface  Miscellaneous Deceased was a stone picker, and in coming from the table he stumbled, and fell down the ladder to the railway, a distance of about 8 feet. 1898 June 10 Hopetoun (Oil shale) Linlithgow Young's Paraffin Light & Mineral Oil Co Ltd David Menzies Miner 48 Miscellaneous underground  By explosives Deceased bored a hole near the bottom of the shale for a "yankee" shot, charged it and ignited the fuse: after the shot exploded, he went back and found it had blown out, and he immediately recharged it, and when the second charge was put back it exploded. Some flame had evidently been left at the back of the hole from the first charge. Gunpowder was used for both charges. 1898 June 14 Gauchalland No 4 Ayr Gauchalland Coal Co John Scott Miner 42 Falls of roof Fall of roof at working face through failing to secure it with crowns as instructed by the manager. 1898 June 18 Bredisholm No 3 Lanark United Collieries Ltd John Walsh Pitheadman 36 On surface  By machinery After re-hosing the winding-rope he was steadying it until the engineman lifted the cage. The cage was raised suddenly, and caused him to fall between the cage and the pithead frame where he was crushed. 1898 June 20 Gauchalland No 2 Ayr Gauchalland Coal Co Wm. Abbott reddsman 56 Falls of roof Fall of roof at his working face through failure to secure it when ordered by the fireman. 1898 June 20 Neilsland Lanark John Watson Ltd John Doyle Miner 48 Falls of side Deceased while engaged lifting bottom coal, heard the head coal "work "; he was about to get out of harm's way, but before he got clear the coal fell on him. 1898 June 22 Gauchalland No 7 Ayr Gauchalland Coal Co James Wallace Pony driver 26 Miscellaneous underground  By trams and tubs While illegally riding between hutches drawn by a pony, upon going through a screen he got caught by the lintel. 1898 June 28 Newbattle Edinburgh Lothian Coal Co Ltd James Pryde Miner 62 On Surface  On railways and tramways Deceased attempted to climb into one of a train of railway vans, while in motion, for the purpose of being conveyed to his work. He fell, and two of the vans passed over his legs, causing injuries which resulted fatally. 1898 June 29 Cults (Limestone) Fife James Martin John Laing Miner 26 Metalliferous Mines While lighting the fuse of a shot, charged with loose gunpowder, it exploded. The cause of the premature explosion could not be ascertained. 1898 July 2 Balbardie Linlithgow Balbardie Colliery Co Ltd Matthew Dougan Chain runner 36 Haulage  On inclined and engine planes Deceased appeared to have been riding up an engine dook on one of a set of loaded tubs, when his head came in contact with a low portion of the roof, causing fracture of the skull. 1898 July 2 Broadrigg Stirling John Nimmo & Son Ltd Charles Irving Locomotive driver 62 On Surface  On railways and tramways Owing to the breaking of a coupling, a train of thirty-nine empty trucks ran away on the main line, and collided with the colliery locomotive which was shunting at the siding. The locomotive driver and brakesman were both very seriously injured, the former succumbing to his injuries on the same day. 1898 July 2 Kelty Fife Fife Coal Co Ltd David Chalmers Miner 17 Falls of roof Killed by a fall of stone from face of brushing. 1898 July 4 Arniston Edinburgh Arniston Coal Co Ltd Alexander Gear Miner 32 Falls of side Deceased was said to have been in the act of rising from the holing to drill a shot hole in the head coal, which was 2 ft. 2 ins. in thickness, when about 18 cwts. of head coal suddenly burst off and fell upon him. 1898 July 5 Bank No 1 Pit Ayr New Bank Coal Co James Sharp Roadsman 33 Falls of roof Fall of roof at brushing face while repairing it. 1898 July 13 Fergushill No 28 Ayr Archd. Finnie & Son Wm. Scott Miner 52 Falls of roof While brushing his road a stone fell from between two lypes. Caused by want of crowns. 1898 July 27 Knockterra Ayr Wm Baird & Co Ltd Wm. McAulay Miner 65 Miscellaneous underground  On inclined and engine planes While drawing a full hutch over the brow of an incline, and having omitted to attach the chain, the hutch ran over him. 1898 July 28 Newton No 2 Pit Lanark Jas Dunlop & Co Ltd John Colquhoun Miner 32 Falls of side Fall of "falling" at working face. 1898 August 4 Jellieston Ayr Dalmellington Iron Co Ltd John Docherty Fireman 60 Falls of roof Fall of coal roof in a roadway while laying rails. While attempting to step from a needle to a bunton, a distance of 4 feet 3 inches, to reach the signal wire, he fell down the shaft. 1898 August 10 Elphingstone Haddington R & J Durie Ltd John Henderson Bottomer 38 In shafts  falling from part way down Deceased descended the shaft to go to the pit bottom, and through a misunderstanding the engineman stopped the cage opposite a pump, and deceased, who had no light, stepped off the cage. He fell a distance of 14 fathoms. 1898 August 15 Climpy Lanark Climpy Coal Co John Orr Miner 22 Falls of roof Deceased and his brother were engaged "winning" out inside a "hitch," and while holing the coal the roof suddenly fell out from between two parallel lypes and injured the spine. He died on 8th January, 1899. 1898 August 17 Rosehall No 7 Pit Lanark R Addie & Sons Collieries Ltd Walter Haddow Miner 26 Explosions of fire damp or coal dust His naked light ignited fire-damp in an unventilated part of his working place. Another man was also injured. 1898 August 23 Maxwood Ayr Wm Baird & Co Ltd Wm. Wright Coupler 13 Miscellaneous underground  By trams and tubs While drawing forward full hutches in pit bottom bye, a race of hutches drawn by a horse came up behind, and he was run over. 1898 September 9 Ayr Colliery, Drumley No 1 Pit Ayr George Taylor & Co Walter Dunlop Miner 28 Explosions of fire damp or coal dust A sudden outburst of fire-damp rendered the air current explosive, and it ignited in the airway at the naked light of the fireman, who was not aware of what had taken place. Other six men were injured. From Main body of report: The third fatal explosion happened at Ayr Colliery, in No. 1 pit, Drumley, and by it 7 men lost their lives and other 6 were injured. Nos. 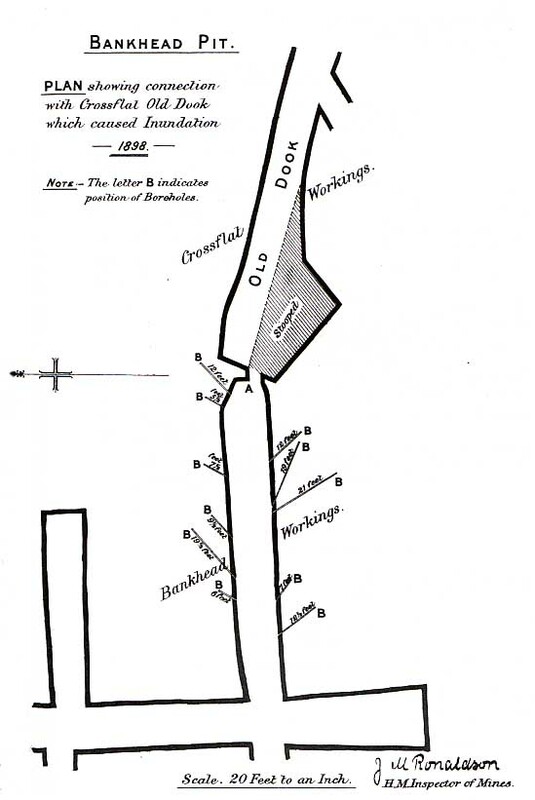 1 and 2 pits, Drumley, have recently been sunk, and the Diamond seam, 3 feet 4 inches thick, and lying 189 fathoms from the surface, was being opened up by the longwall system. The annexed plan, No. 1, shows the workings at the date of the explosion. The air current, stated to have amounted to 5,000 cubic feet per minute, circulated as shown by the arrows, and naked lights were in use throughout the workings. It appears that shortly before the explosion the workmen employed in the places A B D E retired to the heading-road to the point K, on account of the roof beginning to "work," and also the hissing noise of a discharge of fire-damp. The fireman, who was in the section F G H, shortly after having left the section from which the men had withdrawn, unaware of what had happened, was returning to these latter places along the airway, and when he had reached the point L, his naked light ignited fire-damp, and caused the explosion, which swept through all the longwall working places, except the place H, and also extended down the heading K. The men employed at H, and two workmen and the manager who were in the level J, were uninjured. Six of the deceased men were at the point K at the time of the explosion, and the seventh was at work in the place F, but was afterwards found at the point M.
From the account given by the survivors, among whom was the fireman whose lamp ignited the gas, there seems to be no doubt that, owing to the working of the roof, there was an outburst of fire-damp, evidently in the vicinity of the working places A or B, and that the gas was carried in an explosive state by the air current to the fireman's naked light. The explosion was not a violent one, and little damage was done to the workings. The manager stated that an hour after the explosion there was no fire-damp or afterdamp in the seam, except a trace of gas near the heading face C, from which the air current was diverted by the screens having been blown down. The workings are dry, and after the explosion there was a coating of coal and clay dust throughout most of the working places, with traces of coked dust on some of the props. Apparently the explosion was intensified by the ignition of the coal-dust. 1898 September 9 East Balquhatstone Stirling John Nimmo & Son Ltd Esau Edwards Bottomer 69 In shafts  falling from part way down One side of the shaft is used from the Lady Grange Seam to the Splint Coal, a distance of 24 fathoms, for passing down in the cage to attend to a pump. The shaft is then opened at the Lady Grange by raising two doors. Deceased was engaged closing these doors after the oversman had ascended from the Splint Coal, and in some unexplained manner he fell to the Splint Coal. 1898 September 9 Thankerton No 4 Pit Lanark John McAndrew & Co Malcolm Miller Miner 40 Explosions of fire damp or coal dust He went into a disused road, to " knock " through to his working place, when his naked light ignited fire-damp. 1898 September 19 Durie Fife Fife Coal Co Ltd John Miller Pithead worker 40 On surface  By machinery While attempting to push an empty tub off the cage of a steam hoist, it suddenly dropped, and deceased fell to the ground, a distance of 21 feet, and was killed instantly. 1898 September 21 Deans (Oil shale) Linlithgow Pumpherston Oil Co Ltd Thomas Laing Miner 26 Miscellaneous underground  By explosives Two gunpowder shots were ready to fire at the face of a dook. Deceased and another miner agreed to light one shot each. They retired after deceased had lit his shot, the fuse of the other shot was thought not to have kindled, but it exploded just as deceased returned to the face after the explosion of the shot he had lit. 1898 September 23 Barncluith Lanark Archibald Russell Daniel Woodhead Miner 51 Falls of side Deceased was believed to have been setting a prop near the face of a "cut" which he was taking off a stoop when a piece of head coal fell upon him, causing injuries to which he succumbed nine days later. 1898 September 26 Neilsland Lanark John Watson Ltd Edward Curwood Miner 42 Falls of side Deceased was working at the face of a stooping place in the Ell Coal seam, when some coal from the upper part of the seam suddenly burst off and fell on him. 1898 September 26 Woodend Linlithgow Coltness Iron Co Ltd Nathaniel Duff Miner 45 Falls of roof Deceased was engaged taking off coal, when the roof fell, and he was crushed between the coal face and a prop, and killed instantaneously. The roof fell away from a "lype" which had been bared when the coal was taken off the face. 1898 October 8 Holmes (Oil shale) Linlithgow Holmes Oil Co Ltd Dennis McAulay Miner 34 Falls of side Deceased was taking out a stoop uphill, and, after firing two shots, was engaged at the face holing with a pick, when a block of shale fell from a clay back and crushed him. 1898 October 9 Kirkwood No 2 Lanark Kirkwood Coal Co Michael Penman Engineman 60 On Surface  Miscellaneous He appears to have fallen from the top of the boilers, a distance of 8 feet. 1898 October 14 Saline Fife Saline Valley Coal Co Robert Beveridge Miner 49 On Surface  Miscellaneous Deceased had volunteered to assist a relative to remove a small boiler from one pit to another; while rolling it down a hill, a projecting stud-bolt appears to have caught his clothing. He was pulled over the boiler, which in turn rolled over him, fracturing his skull. 1898 October 20 Arniston Edinburgh Arniston Coal Co Ltd John Hay Miner 41 Falls of roof Deceased was setting timber to secure the roof at a longwall face, when a large stone fell upon him, killing him instantly. 1898 October 21 Callendar Stirling Callendar Coal Co John Allison surfaceman -- On Surface  On railways and tramways Deceased and three other surfacemen were riding on a bogie over which they lost control. The other men got off, but deceased remained on until it ran into a waggon. 1898 October 22 Harthill Lanark James Wood Ltd Joseph Gillespie Oversman 61 Falls of roof Deceased was directing some others who were redding an air-course through a longwall waste. They had just commenced at the side of a haulage-road, when the roof fell, and a large stone pressed deceased's face down upon the debris. He was extricated in about an hour and a half, but meantime had died from suffocation. 1898 October 25 Nethercroy No 1 Pit Dumbarton Carron Co Archd. Thomson Miner 55 Explosions of fire damp or coal dust Explosion of fire-damp, evidently caused by the son of the deceased unlocking his safety lamp, and striking a match to relight it. Other four men were injured. From Main body of report: The fifth fatal explosion happened in No. 1 pit, Nethercroy and by it one man was killed and other four men were injured. In this pit the Kilsyth coking coal is worked, and safety-lamps alone are in use. In the section of workings where the explosion happened fire-damp is freely given off, and the working places of the deceased and his two sons were the last to get the air current. It seems that they were leaving their working places, after finishing work for the day, when the explosion took place. Upon an inspection being afterwards made by the manager and under-officials, the bottom part of the safety-lamp, belonging to a son of the deceased, was found on the road (the return airway), about 30 yards distant from the coal face, and beside it a split nail by which a lamp could be unlocked, and a burnt lucifer match. The top of this lamp was found 70 yards farther out the road, and near it was a broken tobacco pipe, while in the vest pocket of the other son of the deceased a lucifer match was found. When I visited the pit afterwards, the whole air current in the vicinity of where the explosion happened was so charged with fire-damp, that a blue cap an inch long was shown on the flame of the lamp, but it seems that no one previous to the explosion had noticed such a dangerous state of matters. The inference is that the lamp, which was found open, had become extinguished, probably by the fire-damp, and the owner thereof, having matches and a lamp key, was in the act of relighting it when the match ignited the fire-damp. Workmen employed in this mine have been repeatedly prosecuted before the Sheriff, at Dumbarton, for contravening the regulations prohibiting smoking or having matches or lamp keys in their possession, and the fines imposed have had no effect in deterring them from risking their own and their fellow workmen's lives. It was brought out at the Inquiry in connection with this explosion, that at this and other mines in the vicinity of Kilsyth, when a workman is about to be prosecuted for any of these offences, his fellow workmen subscribe and provide sufficient money to pay his fine and all his expenses. 1898 October 26 Wemyss Fife Wemyss Coal Co Ltd Stewart Mulholland Miner 45 Haulage  By trams and tubs The place of accident was a dook, and a block, consisting of a prop fixed between the roof and floor, was put in near the face on which the tubs rested ; this block slipped out and tubs moving down crushed deceased at the coal face. The prop appeared to be too short. 1898 October 29 Broomhouse Lanark Haughhead Coal Co Ltd Francis Pope Brusher 60 Falls of roof Fall of roof at brushing face. 1898 November 2 Ayr Colliery, Sundrum No 3 Pit Ayr George Taylor & Co Archd. Frew Miner 40 Falls of side Fall of coal and stone from working face. 1898 November 3 Earnock Lanark John Watson Ltd George Sommerville Miner 14 Falls of side Deceased and a miner who employed him had arrived at the face, and before the miner examined the place, deceased commenced to work at the coal with a pick, when a quantity of coal fell from the upper part of the seam and crushed him. A stooping place in the Ell Coal. 1898 November 4 Bonnybridge (Fireclay) Stirling Bonnybridge Silica & Fireclay Co James Kirkwood Miner 56 Falls of roof After firing a shot deceased returned to within a few feet of the face, when some stone fell from the roof on him. 1898 November 9 Pollok Colliery, Lochinch Pit Renfrew Wilson's & Clyde Coal Co Ltd James Kerr Bottomer 40 Miscellaneous underground  sundries He either fell on the plates in the pit bottom, or was struck by something which fell down the shaft. 1898 November 17 Victoria (Ironstone Mine) Renfrew Wm Baird & Co Ltd Philip McEarney Pony driver 14 Miscellaneous underground  By trams and tubs Found dead under the first of a race of hutches he was bringing out to the shaft. 1898 November 18 Nethercroy No 3 Pit (Ironstone mine) Dumbarton Carron Co Duncan McDougall Labourer 44 On Surface  On railways and tramways Run over by a waggon of ironstone while crossing the rails in front of it. 1898 November 23 Douglas Lanark Coltness Iron Co Ltd William Moffat Bottomer 53 In shafts  falling from part way down Deceased was bottomer at a mid-working in the shaft, and thinking the cage, which was ascending from a lower level, was going to stop at his level, he opened the gate and pushed a loaded tub into the shaft, falling with it to the bottom level, a distance of 36 fathoms. The engineman failed to warn him in time by signal. 1898 November 29 Gartshore No 11 Pit Dumbarton Wm Baird & Co Ltd Thos. Brown Miner 54 On Surface  Miscellaneous George Brown poured some naphtha upon the stove in the lamp room, thinking the fire was extinguished, and caused an explosion. Another miner was injured. From Main body of report: Two miners were killed and 1 injured by an explosion of naphtha in a lamp room into which they had gone without authority. One of them, apparently thinking that the stove fire was out, took a can of naphtha, and was pouring some of it into the stove, when the liquid ignited and caused the accident. It seems that they meant to relight the fire in the stove to warm themselves while waiting to get down the pit. 1898 November 29 Gateside No 2 Pit Lanark Flemington Coal Co Ltd Patrick McLaughlan Miner 74 Falls of side Fall of coal. 1898 December 1 Blantyre Lanark Wm Dixon Ltd John Weldon Miner 32 Falls of roof Fall of roof at working face. 1898 December 1 South Broadrigg Linlithgow John Nimmo & Son Ltd George Frazer Miner 24 Falls of side Deceased, who was taking out the last pillar of a stoop, had holed the coal for a length of 9 feet from a shearing cut by a shot, and to a depth of about 2 feet, when it suddenly came away from a lype, and fell upon him. No gibs appeared to have been set. 1898 December 8 Leven Fife Fife Coal Co Ltd John Staig Pithead worker 18 On surface  By machinery Deceased was pushing a loaded tub off a hoist cage, when the cage was raised and he was crushed against a beam above. Some one had tampered with the brake. 1898 December 14 Bredisholm No 1 Pit Lanark United Collieries Ltd Daniel Conlin Miner 22 Falls of roof Fall of roof at working face. 1898 December 14 Rosewell Edinburgh Lothian Coal Co Ltd James Robertson ---- 57 In shafts  whilst ascending or descending by machinery Deceased and five others were descending the shaft on a cage running in wire rope guides, at the usual speed. When about 20 fathoms from the pit bottom, he suddenly fell from the cage and was killed instantly. 1898 December 21 Bannockburn Stirling Alloa Coal Co Wm. Douglas Drawer 17 Miscellaneous underground  On inclined and engine planes Fall of wheel-frame and roof at top of self-acting incline. 1898 December 22 Newbattle Edinburgh Lothian Coal Co Ltd Robert Darling Drawer 21 Haulage  By trams and tubs Deceased was taking a loaded tub down a side road dipping 1 in 5. He appeared to have been in front of the tub in contravention of Additional Special Rule 5. The tub overpowered him and drove him against the dip side of the level, causing injuries to which he succumbed three weeks afterwards. 1898 December 29 Glencraig Fife Wilson's & Clyde Coal Co Ltd Thomas Oswald Pony driver 24 Haulage  By trams and tubs Deceased was coming outbye with a loaded rake, and by some means unknown fell in front of the tubs. It is supposed he was attempting to shift the points in entering the lye while the tubs were in motion and stumbled.